Our heavy duty replacement model for vehicles originally equipped with the 700 or those wanting to upgrade to an overdrive with a maximum of 325 horsepower. This model features over 25 upgrades and modification to improve durability and performance and comes with our heavy duty lock-up torque converter with stall speed up to 1800 rpm. Includes PTGM18A torque converter. 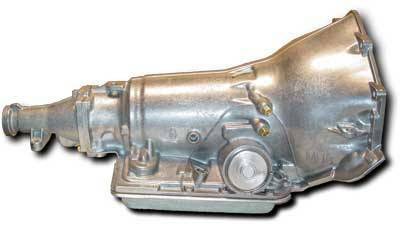 Our most popular performance transmission, we have been modifying and improving this trans since it was first introduced in the early 80’s. We offer several versions of this trans for applications up to 575 horsepower. This trans has a low first gear ratio of 3.06 to 1 and an overdrive ratio of .70 to 1 which translates into stump pulling low end and a 30% reduction in cruise rpm. This trans was built with a Chevy only bolt pattern, but we have a package for Buick, Olds, Pontiac, and Cadillac people so you can enjoy the benefits of this excellent transmission too. We also provide a custom rebuild service for those interested in keeping the original trans but need an upgraded version to handle additional power mods. Call for more details.